Something hit me as I was thumbing through the Gospels recently though. I was looking at Luke, and his account of the beginning of Jesus’s ministry. Jesus was tempted. We read it and it often just runs off our conscious mind. Tempted. I’ve been meditating on that thought for a while before I wrote this. I learned how to hearwhat God wanted me to say when I first left home. I had an old camping gas stove with an oven that had 2 temperatures: on and off. Full power or nothing. It made cooking experimental, but I learned that if I was cooking in the oven I had to just go and check to see if it was ready yet. I heard another minister, Andrew Wommack, use a similar analogy some years ago to my great relief. Sometimes we need to just sit with the concept God puts in our heart until it matures and is “ready” to be shared. We read the passage almost flippantly. Jesus fasts for forty days, then He’s hungry. Hang on a moment – hungry? Satan challenges Him to turn stones to bread if He is who He claims to be. Temptation. A few years ago I did my longest fast – 10 days. On the 11th day I ate. And ate. Thankfully for the horses in Buckfastleigh, none of them ventured into my home. Jesus went 40 days without food, and was hungry. Tempted. When we read the passage it’s easy to only see the God in Jesus. We don’t see His physical pain of hunger. We don’t see the struggle He experienced. We don’t see the decision process. All we see is the outcome. He counters with the Word. Satan shows Him the kingdoms of the world and offers them to Him in exchange for worship. Jesus had come to claim the kingdoms of the world. Here they are offered to Him. No crucifixion. No torture. No death. All He has to do to avoid it is bow to Satan. He knows the torment He will endure. He knows the suffering He will go through. He’s offered a short-cut that would avoid it. I’m no good with temptation. One more mince pie. Just another chocolate. Once it was even marijuana. I caved. Gave in to the peer pressure and temptation. Regretted it instantly. Struggled with it for ages, and repented. I had that option. I had the choice because of Jesus. Because Jesus resisted His temptation, my repentance is accepted. Jesus is the true Hero. The modern movies all show the hero as some kind of indestructible and unstoppable force. Nothing can break him down or prevent him from reaching his goal. But the ones based on the good books of the past, Lord of the Rings, the Narnia movies. Going back a few years, most of John Wayne’s cowboy roles in his later movies had the same element: The hero could fail. It was a real possibility. The hero was human. He struggles with temptation and you don’t know if he’ll succeed. Clint Eastwood captured it in “Unforgiven” as William Munney struggles to not revert to the murderous man with not conscience he had been in his youth, ultimately losing the struggle when his friend is killed. What if Jesus had responded that way when He was told about John’s execution? What if when the thief’s taunting to prove He was who He claimed had been accepted and Jesus had come down from the Cross? Beaten, tortured, His flesh torn from His back. The temptation to come down must have been real. In Gethsemane the stress caused his sweat to fall like blood. I wrote earlier this month that Jesus was so tormented by the thought of what was to come that it would be easy to see the temptation of suicide in His cry of His soul being troubled unto death in His cry to His Father. I’ve been to the point of suicide, and He was what brought me back. His ability to overcome the temptation gave me the strength to recover – the fourth time when I actually let Him. Jesus the Man is my Hero. God in Him completely, but as human – more human than we are. Human as Adam was before the Fall. Adam succombed to temptation. Jesus redeemed us by resisting. The Hero of the Battle. I had an interesting on line conversation with an atheist recently. He was spouting all the typical “scientific” answers to the miracles and creation and how through history science has been steadily disproving the Bible. I’ve looked up all the scriptures quoted in this image. If you consider the “scientific” terms of the day they were written, every one is accurate according to “modern” and “scientific” proof. 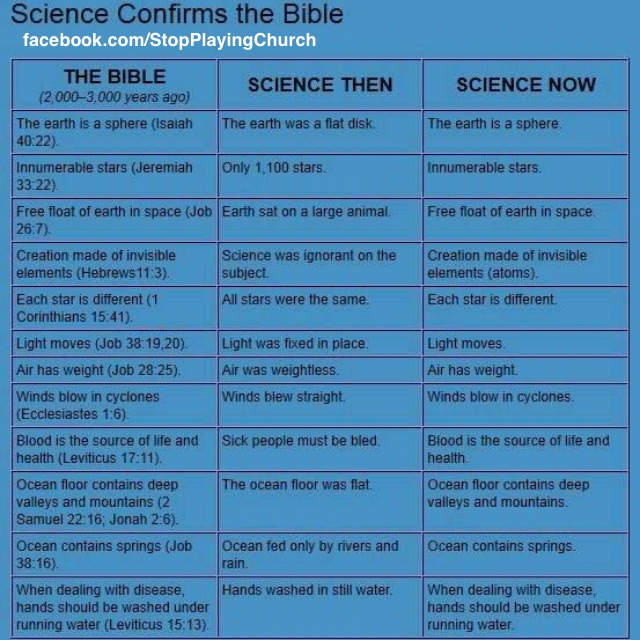 The same proof that also gave us the centre column until science caught up with scripture. As Christians we tend towards turning the other cheek because Jesus said it. We lean towards meekness because Jesus said it. But our understanding has changed, and we also need to catch up. The same One who said “Turn the other cheek” sat down, braided a whip and started a stampede in the Temple when the money-changers were defiling the house of God. Being meek and humble has nothing to do with being pathetic and submissive. Meekness and Humility are God’s way of saying “Be who I made you to be – nothing more and nothing less” The phrase isn’t explicitly in scripture that way, but in the Pentateuch Moses is described as the most humble man in the world. FYI, Moses wrote the Pentateuch. Humility is accepting who God says you are. It’s demonstrated in the lives of Joseph, David, Josiah, all the prophets. In modern times you see it in men of God like Billy Graham who seek to only point to God, not to gather glory to themselves. The evidence is what is seen in their lives. The more men give Glory to God, the more God tends to Bless them. And many who are raised to high positions by God and receive material possessions are criticised by men who don’t know the full story. I met a man some years ago who ran a ministry to help the underprivileged in his city. He was personally a multi-millionaire, but his income was only 10% of what he received. He put the other 90% into the work God called him to. How different would our lives look if we did the same? I was touched and honoured by talking to this man as his humility was truly awe-inspiring. He worked tirelessly and personally giving out the food and arranging shelter for the homeless. He preferred to be on the front-line of the battle and employed managers to oversee the financial affairs of the work to enable him to do what God called him to. His reasoning was simple: David sinned with Bathsheba because he became so successful he employed other men to do what he was called to – lead in battle. David was at home in his palace when it was the season for kings to go out to war. The story is in 2 Samuel 11. He stayed home, saw Bathsheba bathing, got her pregnant, recalled her husband from the battle then sent him back and had him killed so he could marry Bathsheba and cover his adultery. This minister didn’t want to be tempted to destroywhat God called him to by sitting home counting the books. I’ve seen promising ministries fall and men of God walk away not just from their Ordained Vision, but from God as well because they got so focussed on the job they lost sight of the reason. They stopped having Fellowship with believers because they didn’t have time: they had to finish the project they were doing. Magazines, recording studios, writers (including myself for many years) who quit their Love for the work, and as a result the work and the Love went sour. Mercifully, God seems to love to give us another chance, and I’ve seen nearly as many ministries restored as fail, and I hope I can keep going this time myself. I’m a man who is easily distracted. The “experts” label it ADD – Attention Deficit Disorder – and recommend therapy for me to “overcome” the “disability”. I prefer to think of myself not as disabled (I’m not), but as susceptible to temptation. If a doctor wants to call it ADD, let him. Man’s labels rarely affect how I see myself. What I do recognise is when I’m not around my Fellowship – and there’s a BIG difference between a true Fellowship and a local church (not that they can’t be the same – don’t misunderstand this) – I am more easily distracted than when I am accountable and encouraged by God’s people round me. We all have Spiritual ADD to some extent. Satan attacks us. We get distracted and go off on a tangent. I imagine some readers think I’m off on one now! But this Spiritual ADD has been around since before King David. What do you think was the spirit behind David staying in Jerusalem? Just because science has given it a 21st century label doesn’t make it a “new” problem. Moses saw it with the former slaves. He climbs a mountain for a few days to talk to God and when he comes down the people have started worshipping a cow made of gold! Spiritual ADD! We need to keep our eyes on Jesus as the author and perfecter of our faith. Or we end up like Peter – sinking fast. So let the world do it’s thing. They’ll catch up eventually with where God is. Remind ourselves that the Renaissance “scientists” who discovered what much of today’s theories are based on were doing it to find out more about God and how His creation worked. Remember they were concerned (mostly) that they may be being misled by Satan and so they balanced their science with intense study of the scripture as well as the sculpture. Had he not known and understood the Bible, could Michelangelo have painted the Sistine Chapel or carved the stature of David? Could Da Vinci have depicted the subtleties of the Last Supper? It’s doubtful that a work simply “commissioned” would have captured such details. Michelangelo’s fresco of the day of judgement even includes an image of the artist himself being tested. So science, and atheists will catch up eventually. Until they do, we just need to remind ourselves that we were given the answers millenia ago. And let them play catchup at their own pace. I recently mentioned Jesus was dropped into a world at war. But there’s something I left out in that post, and I left it out deliberately. When I visited the War museums in the Somme and Ypres as a young teenager and I saw the graves of boys the same age I was, just 13 and 14 years old, who had been killed in the battles. It was a sobering experience. In with the photos was a section around Christmas 1914. The men came out of the trenches – against orders – and walked into no man’s land between the trenches. Armed only with cigarettes, family photos and a soccer ball they spent the day talking, swapping stories and playing together in an unofficial ceasefire. At the end of the day they swapped cigarettes, helmets, addresses and memories and returned to their trenches. The following day they began killing one another again. For one day they turned their backs on the petty politics of the aristocracy that had caused the conflict and resumed their lives as men. Before the orders were resumed, humanity reigned for just one day. In his time on Robben Island, Nelson Mandela grew a few plants to give himself a measure of control and remind himself that nothing stays the same. Viktor Frankl made choices internally whilst in a Nazi concentration camp that gave him a truer freedom than the guards who held them. Jesus held to His vision, us, and endured the Cross. The Cross is the point of the Battles for Christmas. It’s message through the ages prompting extraordinary actions by the ones courageous enough to follow through. He will guide us in our walk, but we may need to break man’s rules to do so. Sometimes it will mean taking a soccer ball into a war zone and remembering your opposing combatants are men, just like we are. Sometimes it will mean nurturing a single flower in an otherwise barren and hostile environment. Sometimes it will mean reaching far beyond these subtlties and, like Jesus, being prepared to lay down our very lives in His Name. So our warfare is not only at Christmas, but this time of year we get a chance to remind ourselves what it’s really about. It’s not a tree. Or turkey. Or mistletoe. We need to remember the “Why” of the manger. We must remember the message of the Angels. And most of all, we must remember we did nothing that made us worthy of saving. It was all His idea. And THAT is the biggest battle in our minds. Actually, it’s a rememberance of a battlefield. It’s a celebration of God Himself parachuting behind enemy lines and waging a war from the second of His conception to the crucifixion and beyond to the Glory of the Resurrection. We lose sight of it so easily. We have a sanitised picture thanks to the renaissance artists of an unsoiled saviour in a clean hay bed gurgling contentedly and reassuringly to the nervous adults surrounding him. Anyone who has read any of my writing will realise I’m deliberately not using capitals to refer to the infant Jesus in this description. I’m doing it for a reason. The Saviour I worship and have given my life to was a real human baby. I’ve been around cows and stables a few times in my life. Even the clean hay isn’t clean the way it is in the paintings. “The cattle are lowing”. Lowing is noisy, rude and deafening. Bellowing would be a good description. Lowing cows are not sanitised. The stable was not cleansed and sanitised. In South Africa there are kraals for cattle in the villages. They are not clean or quiet. Stables are smelly. Even after they’ve been mucked out the smell of animals and manure lingers for a long time. Then there’s the other things to consider. Kings, sages, wise men or whatever you want to refer to them as came to visit Jesus. They first go to Herod, expecting a King to be in a palace. They eventually find the young child possibly as much as 2 years after His birth. They worship Him and offer their gifts. If they were sorcerors from the day then maybe that sheds a little more light on their gifts. Gold, Frankinsense and Myrrh were traditional ingredients in spells. Maybe they were doing more than giving Jesus a gift. Maybe they recognised something here worth surrendering their lives to. Worship was followed by genocide though. Jealousy tore into Herod and he had all male children under two years old slaughtered. Think of the opening scenes of “Saving Private Ryan” or the sight Oskar Schindler witnesses in “Schindler’s List” as he sees the bodies of hundreds of innocents dropped into mass graves or burned in the furnaces of Auschwitz. Pharoah’s assault actually had nothing on Herod’s. Pharoah was evil, yes. But he wasn’t trying to eliminate one specific child. To murder an entire generation to try to eliminate just one baby boy takes a special kind of evil. The battlefield is an ugly place. As a teenager I visited the battlefields of the Somme Valley in France from a century ago. In the museums there are photographs of men wounded in the battles. Limbs ripped off, bodies disfigured and mangled in death. But the most disturbing images that made the deepest impact on me were the ones of the men who survived the initial injury but who knew they would die of their wounds. Men with their lower jaw missing, unable to eat or drink, the wounds cauterised by the blast so blood-loss was minimal. They died of thirst or hunger, and they knew it would happen. The difference between them and us is they knew they were dying. There was no doubt for them. The battlefield was littered with their friends and adversaries, and they knew they would not live much longer. We have no idea how badly we are inured much of the time. And more than that, we don’t even acknowledge the fight. Like some spiritual incarnation of the black knight from Monty Python’s “Holy Grail” movie we blunder on, seemingly oblivious to the damage done to us by the enemy. And so the Battle for Christmas rages on. The enemy has done immense damage to the concept in the last hundred years, and it was so insidious that most of us didn’t even notice. The rosy-cheeked image of “Father Christmas” and the excesses of food, wine and gluttony along with self-serving outbursts associated with the season are more in line with Bacchus than Jesus, and the intolerance we demonstrate in shopping malls is the antithesis of Christ’s message. Yet if a Christian dares to say something we are derided and called kill-joys or worse. If we point out that the point of the Manger is the Cross people look at us like we’re crazy. But we need to return to the heart of Christmas. Since “Xmas” was initially using the Greek letter at the start of the Greek for Christ, and later an actual cross used for the sake of the illiterate masses I have no problem with shortening the word. Holiday is a condensed version of “Holy-Day”, and again I see nothing wrong with it’s use, but the commercialisation is ludicrous. Two years ago I wrote to the largest supermarket chain in South Africa with a complaint. They had begun putting their Christmas decorations up and playing Christmas misuc in their stores in mid October. After some backwards and forwards emails I had to finally resort to pointing out they would never dare to do the same for Ramadan, Eid, Yom Kippur or any other religions holiday from another belief system, and why should this be any different. Only then was I given an apology and the music and decorations removed for another six weeks. A minor battle, perhaps, but one I feel was essential. The onslaught continues against Christian messages. We have “Season’s Greetings” to avoid offense, but posters celebrating every other religion. The Church needs to rise up and take back the ground. It’s not too late. And it’s something we desperately need to do to remind ourselves through the mire of consumerism the Jesus came into a war, to fight for us, and to give us the power to fight back. I love the movie ‘The Patriot”. The battle scene where the Redcoats in their arrogance are ordered over the blind summit in pursuit of the militia and the ensuing defeat at the hands of the colonies’ army who push back, hold the line and take the field. You see it in rugby. The underdog team suddenly finding the will to push back like the Springboks as shown in “Invictus”. In “The Blind Side” where the young Michael Oher pushes his opposing player the entire length of the field after quietly taing abuse from the opposition. Less physical sports don’t reflect it so effectively, and movies tend to therefore not get made about it to the same extent, but there’s something in there that speaks to me. Recently I wrote about a Line in the Sand, and this is kind of a follow-on to that. I was talking to my wife yesterday and the thoughts began to formulate for this entry, but it’s taken a while to percolate through. We forget this. But that doesn’t make it any less true. And holding on to your confession, drawing that line and saying to the enemy “Enough!” is harder the more battered you are. And right now we’re battered. There’s a temptation to compromise. To let go of the “less important” stuff. For too long I focussed on Eternal Life and Salvation as the “essentials” of Faith. Mature stuff. Esoteric and stoic in the face of adversity but maintaining a stiff upper lip. Then something changed. I realised what Jesus went through to provide Health and Prosperity. All four are linked. Inexorably and inextricably joined. To disregard one is to slap Christ in the face. Jesus was scourged before the crucifixion. Scourging left deep penetrating wounds cut into the flesh. Stripes that wounded Him. The Romans wove flint flakes and bone flakes, razor sharp, into their whips for scourging. His flesh would have been shredded. Most men would have died from the wounds and blood-loss. How can I then reject my physical healing bought at such a high price? God gives financial prosperity as a sign of His Covenant. We disregard it. What does that say of our attitude to Him and the Covenant He gave us? So the line is drawn, but right now it’s in enemy territory. I need to muster my strength and push abck the enemy, reclaiming what has been lost and taking hold of everything God has promised. It’s hard. This is a long and bloody war we are fighting. Many warriors lose heart and give up. I used to be a big boxing fan as a teenager. I loved watching the Heavyweight Championship fights. But I realised something. As the fighters came out of their corners to shake hands before the first round, you could almost always tell who would win. When Mike Tyson fought Frank Bruno, on paper Bruno had height, weight and reach advantage over Tyson. Tyson beat him inside the distance. Bruno, big-hearted though he was, had entered the ring not certain he could win. Tyson had entered not considering losing a possibility. And you could see it. We need to focus on Victory over the Enemy, no matter what he throws at us before we attain it. I can look at my current circumstances and decide it doesn’t work, or I can use what has happened to spur me on to press in deeper and see a greater victory than I could ever have imagined. Joseph could have quit when his brothers threw hi into the pit. He could have quit when Potiphar threw him in jail unjustly. He could have quit when the man whose dream he interpreted forgot about him. But if he had, he would have never seen the fulfillment of his Vision. Most of Egypt would have starved, and Joseph would never have been raised to a position second only to Pharoah in power and wealth. I want to be a Joseph. A Visionary who holds fast to the vision until it comes to pass, irrespective of the transitory facts. I would encourage anyone to do the same, but remember: Battles are ugly. The enemy is cunning and devious. His weapons are thoughts and mind-sets. We must wrestle those same weapons from him and use them ourselves, just as David beheaded Goliath with his own sword, so must we defeat the enemy by wrenching his own weapons from him and using them on him. Take back what’s been lost. Then push forward and claim New ground. Let God expand you and wreak havoc in the enemy’s camp. OK, not a Christmassy title. But it’s very real for me this year. Living a life of Faith means sometimes you get hit. Sometimes hard. Sometimes so hard you lose yourself and the ability to progress. Your heart hardens. You lose forward motion and you start to harbour malicious and vindictive thoughts. Any honest Christian will admit it. Even Paul said he did what he didn’t want to do and didn’t do what he wanted to. I suspect that included thought patterns. Although he sang praises in jail, I expect he had moments when he was just really pissed at being there. It’s humanity rearing it’s very ugly head. Recently my wife and I moved in with my mum, technically a seperate-entrance room on her property. It’s been a difficult transition, especially since we both believe it’s not where God intended us to be. It’s been made more difficult still by a person living in the house next door. I’ve not met him. Never set eyes on him. But he shouts over the fence at our dogs if they squeak. He leaves notes in the mailbox complaining about our excessive noise. It’s hard to forgive him. It’s hard because he runs his well-point just over the fence from us for 5-6 hours at a time. It runs at a frequency that the military uses as “white-noise” to flush out terrorists and the enemy. Migraines and sleeplessness. Irritability ensues from the relentless onslaught. And I try to turn the other cheek. What I really want to do is climb the fence and rip out his watering system. I long to gag him and his visitors when they make a noise in their garden. So far I’ve not even responded to the note as my anger is too hot to do so in a Christian way. I can’t post here what I’d like to say, as I would have to re-classify the blog as over 18 only. I’m a Christian, but I’m still a work in progress. I need a miracle in my life, as we all do from time to time. It’s Christmas. In the last few months, my wife and I have lost almost all our support network of friends, family and even healthcare professionals. We struggle daily, not with the big stuff, but in the little things. Right now we sleep on a borrowed bed in a borrowed room. Most of our posessions we are trying to sell, and there’s the very real possibility that the business we fought so hard to establish over the last 6 months will have to close because of failure to comply with fire laws by our landlord costing us ten days of trade. I believe in Prosperity, Health, Salvation and Eternal Life as part of Christ’s atonement. But I also know we gain persecution as part of the package. Unforgiveness is in me right now. I try every day to take the thought captive and submit it to Jesus, but it’s hard. It doesn’t come naturally. It’s followed by all the accusers in it’s wake. Judgement, condemnation – both of myself and the person I can’t forgive – anger, bitterness, pride. They all get in. It’s a season to forgive and forget. It’s a time to remember what Christ did for us. It’s no wonder the enemy has fought to destroy it in the public mind. Replace generosity with greed. Replace forgiveness with malice. Imagine if Jesus had done that. Kicked in the door of the inn and demanded a room – He’d made everything after all. But He humbled Himself to birth in a stable, death on a cross. Writing is cathartic for me. Re-reading reminds me of my true Heart, the one God gave me when I gave my old one to Him so long ago. So I won’t write to the neighbour today. I’ll forgive him now. And probably need to again tomorrow. And the day after that. And the day after that. And the day after that. But eventually if I keep reminding myself, that unforgiveness will be replaced in me. Unforgiveness is a feeling that becomes an action. Forgiveness is an action that – eventually – becomes a feeling: God’s Love for the person you choose to forgive. So I’ll try to give myself a Christmas gift now. This is a chapter from a book I’m currently working on that I aim to publish in the next few months. I have used adapted chapters in the blog before, but never one of this length. Please read it to the end as I believe it’s an important message, and one that isn’t given adequate thought or time in many churches. I hear these a LOT from Christians. I’ve struggled with them myself – and probably always will. There’s always more to learn and do in our Walk with God. Always more that we feel we should have seen or done. Could have done or said. Would do or say if we had the chance again. Jesus was explicit in His teaching on healing, casting out demons, in fact every instance where the word “sozo” was translated differently depending on the context. He spoke to the Centurion and agreed to go to his home. The centurion refuses, telling Him it’s not necessary as he understands the power of authority. And Jesus is gobsmacked. Yes, Jesus is surprised. By the fact that the centurion believed? No. But by the fact that the whole of Israel to this point had not produced anyone with this level of understanding of Faith in Him. The centurion’s servant is healed. The Samaritan woman’s burden is eased. But why does it seem like it doesn’t work sometimes? There’s a number of clues in Scripture to what happens – or fails to happen – when we pray that decides by our actions whether we receive or relinquish the answer to our prayers. For simplicity’s sake I’ll only mention a handful here, but there’s more – many more – than I have here. First, we need to address a simple question: Is it God’s Will for (X) to happen? (X) can be anything. Healing, Prosperity, a new car, enough money for a pint of milk. Anything we’re praying for from a position of need. The need is the issue. It’s a perceived “need” we have that we’re asking for, or to be set free from. So is it God’s Will? Generally, a Christian will look to pray in line with God’s Will. We try to seek His face in our lives. It’s the New nature. I must stress, what I’m saying here does NOT apply to non-believers. They may get lucky in their prayers, like a monkey typing Shakespeare by hitting random keys, but in general what I’m saying here calls for a known relationship with God. Knowing His Will is the key. Jesus called us His Friends in John 14-16. He said we needed to maintain a perspective on Heaven – His Father’s house. This actually hits 2 points. Confirmation that God’s Will is to Heal – and we’re talking physical healing, not some transcendental claptrap referring to an “ethereal” state of being in the afterlife. This World. This life. Right now. Isaiah echoes it: Isaiah 53:5 says “by His stripes we are healed”. Peter changes the tense, indicating his revelation of the New Covenant in Christ: 1 Peter 2:24 “By whose stripes you were healed”. It’s done. Complete. Established by the crucifixion and resurrection. The second point Exodus 15:26 makes is that God doesn’t put sickness on those under the New Covenant. Now OK, Exodus is in the Old Testament. But when Jesus was being interrogated by the religious leaders He stated “Before Abraham was, I Am” (John 8:58) Either the statement was possible more profound than almost any other or Jesus needed Grammar lessons. Now if Jesus’s sacrifice reaches backwards as well as forwards, which His entire Ministry indicates is the case, then we can be certain God does not put sickness onto us to teach us. Jesus was a perfect reflection of the Father, and as such perfection He did everything God did – and does. Anything He did, we can do. Anything He didn’t do, we can be certain means it is not part of God’s will. There isn’t a single reference in the New Testament of God using Jesus to put sickness, death or poverty onto an individual to teach them. Not a single instance where someone who came to Him in faith being turned away. Every person who acted on their faith received their need met in full – and only once did He need to pray twice for the same person – and that, like the problems in His home town, was related to the blind man’s faith, not Jesus’s. So yes, Healing is God’s Will. Now. But we can delay it. God will not usurp our authority in our own life. We have a choice to accept or reject His Blessing. I regularly fall over myself when I’m praying. I end up with “I’m not worthy of this that I’m asking for” screaming through my head. When I let it, it prevents me receiving from God. Every time. The first example of that is in Exodus. The land is filled with frogs. They are everywhere. Houses, gardens, dinner tables, beds. The plague has been going on for a while, and Pharaoh has had enough. He summons Moses and tells him he may take the Children of Israel to sacrifice to God and Worship Him – if the frogs can be taken away. “Tomorrow”. Moses’s instruction from Pharaoh is to pray the next day. Pharaoh has the authority to tell Moses to pray there and then. Take the frogs out right then. He delays it another day. We do the same. Sometimes we’re so used to the pain we’re in that we cling to it and can’t give it over to Jesus. It’s our plague of frogs. It prevents us receiving God’s Will. From seeing healing or prosperity or any answer to the prayers we throw out every day. The next thing to consider is timing. Timing is used as an excuse for many things. It is used by us to explain why we didn’t receive what we asked God for. We use it to avoid responsibility for our doubt or unbelief. We have to accept responsibility for our actions and choices. God has done everything He needs to do for us to have everything we need. He sacrificed His Son for us to have relationship with Him restored. Jesus went through whipping, crucifixion, death and Hell for us to have everything He gained from it. This modern world is big on passing the buck to someone else. Responsibility has been swept away and deniability ushered in. We have it in every aspect of our lives on a daily basis. Whether it’s a psychology reference telling us that homosexuality is just another type of “normal” or a national leader justifying the use of public funds for his personal desires or a sporting hero crying “the Devil made me do it” into the microphones of the press we expect it, and worse we accept it. Christianity is based on taking responsibility for our actions, and submitting that responsibility to Christ for His atonement. The whole point of the Faith we walk is responsibility. We have to put our understanding through the World’s eyes away and lean on Faith. Hebrews 11, the great Chapter of Faith, says it is the substance of things hoped for. It is the evidence of what we have not yet seen manifested in the physical world. How long the manifestation takes is, under the New Covenant, down to us. When Daniel prays the first time and receives his answer as he finishes speaking, the Angel tells him that he was dispatched as he began to pray. When Daniel prays the second major prayer he has to wait three weeks for the answer, but again the Angel tells him when his prayer was first received by God he was sent with the response, but demonic interference delayed him for 21 days. Daniel could have halted God’s power by giving up on day 20. The Angel would have been recalled and half the book of Daniel wiped away. But we have to do it. Just as we don’t call the power company to turn on our living room light when the sun sets, we flick the switch ourselves, so God has already set the Power flowing for us to use. We simply need to “plug in” to it and see it manifest. “Simply” may not be the right word. The theory is, granted, very simple. But we tend to overthink things. We look for ways to abdicate the responsibility of the authority we have, because we are unwilling to accept the responsibility that a mistake on our part may cause. Nelson Mandela, who died earlier this month, embodied accepting responsibility brilliantly. He took responsibility for his actions that led to his imprisonment for 27 years. He spoke of his past and hopes for the future regularly and freely admitted he made mistakes. And that he expected to continue making them. He resisted the notion of himself as an “icon”, preferring people to see him as a man with a flawed past and an imperfect nature. His humility in the Godly sense was inspiring – not once did he ever claim to be either more or less than God had made him. But responsibility, whether we like it or not, lies with us. In the same way, however, there are some things for which we are not responsible for. We are not responsible for the way others respond to movement of God. Even Jesus could not override the doubt of His home town. When He spoke to the blind man outside Bethsaida He prayed for him twice, making clay and putting it on his eyes first, then when the man was not fully healed He prayed again and his sight was restored. The man was told not to go back into the town. Bethsaida is listed in Jesus’s prayers later under the “woe to you” section for rejecting God’s Word and messengers repeatedly for generations. Jesus prayed twice, not because His faith was incomplete, but because even though the man had Faith to receive, he had unbelief as well brought in by the people he associated with, the environment he lived in, and his prior experiences up to that point. First Jesus took him out of the town, then as the healing began to manifest at His command, He needed to effectively take the place out of him. Overcome the circumstance, overcome the doubt, see the Power of God flow. It’s our responsibility. We don’t need to believe harder, simply to believe is sufficient. Yes, the more we operate on a particular area, the stronger our faith in that area becomes, just as a bodybuilder who only focuses on his legs will not develop strength in his arms, so if we focus exclusively on healing, or prosperity, or anything else sozo is translated as then that is the area we become strong in. But God would have us walk as “little Christs”, the literal meaning of “Christian”, and see us grow in all areas, not just one or two. This means the issue of timing lands squarely with us. We can speak to fig trees as Jesus did and see them wither – He saw it dead from the moment it was spoken to by Him, and it died. Or alternatively we add “if it be your will” to the prayer and void it completely in the process. Jesus didn’t command the disciples – us – to pray for the sick and posessed. He demanded they be healed and set free. The grammar is an imperative – an order. He heals Peter’s mother-in-law. He raises Jairus’s daughter and the widow of Nain’s son. He calls Lazarus back from 4 days in the tomb. There was no “Father, please if it’s your will then do this” at this point. His relationship with His Father (and ours) meant He could boldly call out – like a Lion’s Roar – for the death and sickness to be gone, and it left. The recipients of the miracles all knew Him, or of Him, and expected to receive the miracle they got. When Jairus’s servants came and said “she’s dead” He turned to him immedately and said “Only Believe” as an answer. I dislike doctors (professionaly only as my wife is an MD) because they bombard me with information and facts. There is littls space in a consultation for Truth most of the time. But as I’ve written on the essential differences between Truth and fact in the past I won’t labour the point here again. We get bogged down in facts. Water boils at 100°C or 212°F but that alone and out of context means nothing. As we move through the life we have, we must remember these things clearly. Next, we must Face the Fight. It sounds over simplistic again. But it’s a simple truth with a lot of power. e-shoes. The shoes demonstrate readiness for battle, and the helmet was head protection, but everything else relied on the belt. The shield was so heavy because of the thickness needed to extinguish a flaming arrow that it was hooked into it. The breastplate was attached to hold it in place. The sword hung from it to ensure readiness for use. Paul likens Truth to the belt. Everything depends on it. We don’t have the strength to carry, never mind use, the rest of the armour without it. But there is an important message in the armour. Nothing protects the back. The armour will be effective only if we keep facing the battle. Only if we face the enemy. In battle, the roman legionaries would pair up and stand back to back. They would fight facing the enemy and protect their compatriot. In the same way, we need to be in a Fellowship where we have support for our back. We can’t defend ourselves from an attack we don’t know about. That’s why we need to keep other believers around. It’s why we need to be around them. It’s why we are told not to forsake gathering with fellow believers. And the inferrence here is not mega-church. It’s intimacy. It’s accountability. It’s responsibility. The big-name teachers from the past were all accountable to a team behind the scenes. From Billy Graham onwards there has never been an enduring ministry where the teachers at the centre stood alone without it becoming about the man. Some took longer than others, but eventually the message is perverted by self and arrogance. Even Peter and Paul had companions around them to keep them on track. Sometimes they needed support. Sometimes they needed correction. Paul, the Pharisee of Pharisees left his robes and sat under a teacher for years before he went out. And when he left he took a companion with him. Jesus sent the disciples out in pairs. What lunacy makes us think we need less? Failure waits for the double-minded man. He takes his eyes off Christ and looks to the world for answers. People die in their sickness because they just “try” healing. They stop by the church on their way to the hospital – just in case God might do something. It’s explicit. He will receive nothing he asks for. But we can infer from the statement what a single-minded man will receive. Jesus was a single-minded man. His focus was on God and accomplishing His will. He wasn’t swayed by opinion or popularity or threats. Just by God. And so we see miracle after miracle recorded. His Faith moved mountains of need at every turn. Wherever He went he saw the fruit of His conviction. We need to set our faces like Jesus. We need to walk with single focus into the enemy’s territory in order to rescue the people trapped there. We need to be clear. Sickness is defeated. Poverty, both physical and spiritual is overcome. Salvation is bought. Eternal Life is ours to claim. In ancient greek history is a story from Spatra where just 300 warriors held off a force of several hundred thousand. They chose their ground to fight and held it, no matter the cost. At the end of it, the invading arme was massacred. Because they stood fast. We must do the same. No matter what is arrayed against us, God promises we will never be exposed to more than we can withstand. The enemy will lie to us. He will tell us we can’t win. He will whisper and scream and shout and dance before us. But we need to stand fast. Patient under trial. That’s what we must be. Irrespective of the trial we must be patient. But patient here is misleading. In scriptural terms it means unwavering. Resolute. Hebrews 10:32 says “But recall the former days in which, after you were illuminated, you endured a great struggle with sufferings”. Another translation describes it as a “fight of afflictions”. But the key is endurance. Endure and stand and receive from God. Stand. Hold your ground. How do we know when the battle’s over? We don’t need to stand any more. Simple, but true. We see the answer to the prayer. Jesus said all who ask receive. Not most. Not all except you. All. All who seek find. All who knock are invited in. So don’t cast off your security in the promises of God. No matter how long you’ve been fighting. Like Daniel, you may only be a moment from your answer, or you may be days or even weeks from it, but the moment it was received in Heaven the answer was despatched. Hold fast. Stand your ground. Remeber if it hasn’t arrived yet it doesn’t mean it’s not on the way. Ask for wisdom to pray in such a way that the result can be received faster. Ask God to make your heart softer to Him so you can be teachable and grow so next time it doesn’t take so long. But hold on most to the promise of Jesus. All who ask will receive. So if it didn’t work yet, remember the operative word is “yet” and keep going. It’s the time of year when we are supposed to welcome the thought of the birth of Christ and the Salvation He bought us. What generally happens is we get bombarded by the World and we take it. Usually without a word. My mum got a card – I’m not going to call it a Christmas card – from a friend of hers in the UK a few days ago. The message on the front: “Merry Winter Festival”. It was bad enough when cards went to “Happy Holidays” a few years ago. Now it’s “Winter Festival”? We’re losing the Christ in Christ-mas. It’s being irradicated and we do nothing. It’s not the actions of a first century Believer. But we Twenty-first Century types are more “sophisticated” and “educated” than St Paul. Oops. Did I step on some toes there? We need to get our toes stepped on. In the UK a few years ago it was a Muslim group that complained when a Cross was taken down at the local cemetery as Jesus is one of their prophets. It was returned within 24 hours. The Christian community said little and did less. What’s wrong with us? There’s a difference between “meek” and “weak”. But that’s been lost too. Seriously? Baby Jesus needed his nappy changed. He fed at Mary’s breast, and I guarantee He burped, farted and did all the things a normal baby does. The First Century believers knew that. How have we lost it? We are losing the power in the Word of God because we stop expecting it to produce fruit. Our prayers for healing, prosperity, even salvation have become weak. The Disciples expected to see Jesus return in their lifetime. They were eager for it. I’d even use the word desperate to describe their actions. Peter stands up and gives a sermon after being filled with the Holy Spirit and 4000 people join the Church. The Disciples are so filled with God’s Power and Spirit that people thin they’re drunk! In the 1990’s there was a revival movement in Toronto that touched a lot of people, but the dilution started almost as soon as the news got out about what was happening there. Holy Trinity Brompton created the “Alpha” courses in reaction to inspiration from the Holy Spirit and it’s a movement that still touches thousands of lives each year. But even there in these “power-houses” of the Church there is not the level of expectation we need. I want to know the passion for my Saviour that Peter had. I want the kind of mind-blowing revelation that knocks me off my donkey like Paul. Every day. Recently my wife and I decided due to expenses mounting up that we would move in with my mum for a while and leave our home of ten years – our entire marriage. In the last month we have effectively been put out of business due to our landlord at the business premises failing to meet fire safety minimum requirements. Although the Fire Department have now given us leave to re-open the damage is done. Short of a miracle we will be forced to close within a month and our options in the natural sight we have will get very small very soon. We’re looking at probably moving back to England for a while and working there, probably for several years which is not ideal for either of us. Now I’m open to a miracle, but to be honest, I don’t think I expect one. There’s a story I recall of John Wesley travelling by boat to the Americas when a storm came up. In the middle of it he heard some Moravian Christians in a nearby cabin singing praises and worshipping with all their might. When he spoke to them, they replied “any moment now we will meet Him face-to-face”. I can’t remember if it was 1990 or 1991 and either Mike Yaconelli or Tony Campolo who told the story. (1990 & Campolo I think) with such passion that it was infectious. But I never got “eager” in my expectation. What do I need to get the sense of urgency Peter and the other disciples had that allowed them to see the results they saw? Hunger. Realisation for a millisecond that I have a more fundamental need for Jesus than I do for oxygen. I can hold my breath for about 80 seconds, and I can exhale and hold out for about half that. Then my whole body screams for me to breathe again. The realisation that I may need something as desperately on a Spiritual level never really hit me until recently. We need to draw a line in the sand. To say “This far and no further”, and we need to draw it where we are standing right now. Just like the first century followers. “Christians” was a nickname – literally “Little anointed ones”. I’ve met one or two who could lay claim to that, and had the priviledge of spending time with them, but the majrity of us blunder about with no expectation of power or change. We pray ineffectual prayers. Peter saw the man at the Temple healed because he expected the power to flow and the cripple expected to receive something from him. We speak, but we don’t eagerly expect an instant response. In fact, the World has done a great job in the last 150 years of beating us down and diluting the message – with a few exceptions – that we don’t expect anything here, but everything will be resolved “when we get to heaven”. I’m tired of waiting. And the more I read the Gospels the more convinced I am that Jesus is tired of waiting for us to wake up! He gave us authority to raise the dead, heal the sick and prosper the poor in this life. Yet we abdicate the responsibility. Forget raising the dead – it’s too much to ask. Clearly the lights in Heaven will fuse if we ask that. Healing the sick? It’s been replaced with telling them where to find a good doctor. Now I don’t have a problem with doctors (being married to one), but the Church is empowered to Heal. We abdicate it. The Church is empowered to demonstrate prosperity and pass it on. Instead we direct the poor and broken to the welfare system of whatever country we’re in. Here in South Africa, they’re probably better off not using the system as it doesn’t work. The average income from the “welfare” here for disabled people cannot feed them for a month, never mind pay their rent. And the church – not all of them by any means, but a large proportion – sits and says “be warmed and filled” then goes home and does nothing. While they fill their own bellies and throw away leftover food that could have fed those same poor. Scratch that. We not they. I’ve been guilty of it and fallen into the trap. There’s noe expectation of the need being met. There’s little expectation of any real power flowing.It’s like being given ownership of Fort Knox and all it’s bullion, then locking the door and begging for scraps on the road outside. How are we so blind? How have we lost the Vision? People perish for lack of vision says Proverbs, but we seem oblivious to it. We die by degrees every day and don’t even realise. We need to return to the simplicity of the men and women who walked 2000 years ago. My wife and I don’t watch TV. We have a dvd collection we use, but the broadcast television is so depressing we stopped watching. The news stories are full of atrocities, the “reality” shows are about greed and the search for mammon to satisfy the need the greed has created. Programs like “Survivor” which I used to enjoy made me realise that actually it promotes deception, betrayal and selfishness to win the approval of the people you’ve lied to, betrayed and trampled so they’ll give you $1000000. Then they come back the next season to try to do it again. s we watch, “24”, “Bones” & “Stargate” being the most recent. The attraction is the flaws in the characters are shown as that: flaws. None of the characters is portrayed as “whole” and they are written and played in such a manner that the characters come to life as believable because they are flawed and they know it. Their greatest struggles in the series are not with terrorits, serial killers or aliens, but their own past actions. Jack Bauer weeps as he sees what has happened. Brennan and Booth wrestle to heal her pain from childhood and his guilt from his time as a sniper. O’Neill wrestles with his son’s death while the rest of the teaqm have their own grief to come to terms with. But although we enjoy the shows, the thing we keep in mind is the nature of ourselves reflected in the characters. They don’t expect to ever overcome their past, only to live with the pain constantly until the sweet release of death. I realised that God will not disappoint us. He will give us what we expect Him to give us in our heart. Be it Everything in His Kingdom, or nothing at all. We will receive what we earnestly expect from God. That can either deliver us or crush us. OK, a somewhat inflammatory title. We don’t usually think of Jesus as suicidal. But He was as human as we are. It says He was tempted in all ways as we are. A few years ago, around 1999 just after my dad died, I suffered ome very dark depression, climaxing with not one, but four serious suicide attempts. Now I’m not saying this as a cry for sympathy. It’s part of my testimony, my story. It has helped make me who I am – but I don’t recommend the route I took. The difference between a cry for help and a serious attempt, incedentally, is how the person handles the attempt. I tried to overdose. I took the pills, lay down on my bed and waited for death to come. Like I said, I don’t recommend this. There was no call to friends and family. No note – everyone close to me knew what I’d been going through. No “final” goodbyes. Just me and the pills. That’s serious. Now I’m not saying people who take the pills and then call family and friends aren’t serious – there is often a regret and recanting of the desire as life slips away. They cry out from a sudden desire to keep going in this world. And it’s hit and miss whether they manage to. But to say Jesus was suicidal at some point in His life? A sinkhole of agony. He hadn’t stubbed his toe here. The agony was emotional. So bad He wanted to die. Wait a second – Jesus said this? Yes. He felt the agony of depression in that moment – and the thought of death came through His mind. He knew what was coming. We’d be depressed at the thought too. Beating. Crucifixion. Death on a cross from suffocation. It’s been described repeatedly through history as the worst method of execution. The arms out to the side, lungs collapse as the body’s own weight prevents breathing. And the Romans perfected it to a form of torture. The natural instinct is to fight for breath, so after they nailed the feet in place, they put a ledge just under the toes so the victim would lift themselves, increasing the pain and prolonging the agony. It was reserved for the worst of the worst. So the White Witch stabs Aslan. Satan strikes Jesus. But the “deeper magic” CS Lewis talks of in the Narnia books is there and God’s Power brings real Life from Death’s clutches. Man is freed and Death itself defeated. But before that, Jesus wrestles with how it will be achieved. The first wave of soldiers on D-Day – most of them died. And they knew they would. The front row of the infantry in the old warfare where troops lined up and took aim knew they were the target. Jesus knew. Jesus felt the fear. He felt the pain. He anticipated the loss. He wanted to die. Not on the cross, right there in the garden. He went through it. He felt it. It’s a strange way to find comfort, realising He actually felt what I’d felt. He was tempted as I was, although He didn’t act on it like I did. I look back now, and I realise it was His humanity that felt that. I always knew He was God, but the realisation he was perhaps even more human than me – perfect in His humanity – and felt what I feel was a revelation. It was that lightning bolt that got me through. Now I’ve had depression come against me again since then. Various doctors have tried various potions and pills to “help”, but they all had the same effect for me. I was left detached, hollow. Like I was watching someone else going through existing but not part of it. So I generally stop the pills and lean on the Gospel. The humanty of Jesus is Good News. He was fully human. He lived and loved and lost and grieved and rejoiced and all the other feelings we experience. It’s Christmas coming up again. It’s the perfect time to remember His humanity and not just His Divinity. Because it was His humanity that meant He could save us. Kings and Queens. Respected and loved by all. It’s summer in Cape Town, and as usual, self-respect when it comes to clothing is shrinking. Don’t misunderstand me here. I suffer in the heat, and in fact am sitting in my garden to write this piece today in a pair of shorts and no shirt. But this is my space. I ride a motorbike, but at this time of year it’s dangerous. Give me ice and snow with a howling wind over the conditions in the city in the summer any day. Ice, snow and wind make you concentrate on the road. In the summer, dress sense departs and leaves in its place string bikini tops that leave nothing to the imagination and shorts so short you’re not sure if they’re actually there or not. I saw a few photos from a young “christians” event not long ago. I’m deliberately using a small “c” here. It was early summer and the outfits were shrinking. In the pictures, the young women were dancing and running and doing what young people on church camps do. The young men were watching and pointing and drooling over the young women. And then there were other pictures where the scene was inverted. I think back a few years to a Christian Art and Music festival I went to in the UK, Greenbelt. It was a particularly hot summer, there was a lot of dancing and running round the main stage where the headline band of the day was playing. But I don’t recall any bikinis. And back then believe me I would have noticed! Even in a gathering where the average age was probably 20 and most attendees were single and looking for Mr or Miss Right there was a sense of self-respect. Yes we danced with passion and abandonment to the music, but our role models – even the majority of the secular ones – had a sense of respect about themselves. Respect has to begin with self. It’s one of the few areas as a Christian where we need to say that. OK, it begins with God, but then we need to respect ourselves first. I respect myself, so I can respect my wife and my friends. Part of that respect is where and when I take my shirt off. Part of it is how I relate to others. Most of it is what I think of God. He didn’t make it so I could show off myself. It’s not designed to be used for as many “conquests” as possible. To respect God in me I must respect the reason He made me the way He did. My wife tells me she finds me physically attractive. Personally I don’t see it, but then she says the same when I tell her that. We live with these insecurities – most of us, anyway – on a daily basis. And they are created by the World to keep us from realising the Truth. If we respect ourselves, warts and all, we can be Transformed into the image of Christ, reflect His Glory and wield His Authority over the World. So show some respect. Learn it. Live it. And we become More than Conquerors.